1991 – Collision involving an VIII from the Royal Free; severe injury to one crew member leading to helicopter evacuation and emergency thoracotomy. This accident occurred due to lack of organisation of boat flow in the marshalling area. Subsequent to this, the current chief umpire has largely been responsible for instituting the current marshalling system, reinforced by the PLA (Notice to Mariners). 2004: near miss where cox steered boat in front of oncoming motor vessel (slow moving); to highlight need not to cross in front of any motor boat at 2005 coxswains’ meeting. 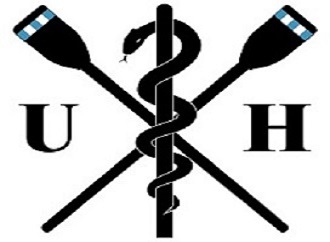 2005: Incident UH05-1; Coxswain sustained back injury (blunt musculo-skeletal) as a result of failing to acknowledge an inevitable bump; need to acknowledge early and avoid any physical contact to be stressed at 2006 races. Ongoing need to ensure adequacy of bowballs. Incident UH05-02; ladies’ crews drifted too far onto the Surrey side when stationary just after the finish. Need to ensure finish marshalling clearly identified to coxes in 2006 races, ensure launch 6 on correct station to ensure adherence to rules. 2006: no accidents - incident UH06-1 - marshalling launch overturned doing tight circle in shallow water - no injury and all equipment retrieved safely. 2007: Incident UH07-3 – BL1 staker hit in the back by a backstay of the following RUMS boat. Going into the water further than the waist will be discouraged. UH07-2 – Bow section of boat damaged following an early bump. Emphasis made on aiming for an off-centre target on the boat ahead. Incident UH07-4 – Near miss when crew went across the course of the pleasure cruiser. It has been made clear that this wasn’t appropriate and is potentially very dangerous. 2008: Incident UH08-3 – GKT staker hit by blade, minor injury. Incident between RVC VIII and MV Henley during marshalling. A RVC VIII proceeded upriver in the 2010: Surrey inshore zone up to Kew Pier on the Surrey side of MV Henley. The boat stopped, and then the cox believed that the master of MV Henley had indicated by a hand gesture that the RVC VIII should proceed through the gap between MV Henley and the pier. As the RVC VIII pulled into the gap, the stream pushed the RVC VIII against the hull of MV Henley such that the blade tips scraped against MV Henley. The RVC VIII managed to pull away and there was no damage to either boat. British Rowing Incident Report ID 5309. In the coxes briefing in future it will be advised that coxes should not attempt to manoeuvre between class V vessels and Kew Pier under any circumstances, coxes should WAIT and proceed around the class V vessel on the fairway side, and anticipate that this manoeuvre may well pull the oared boat well into the stream. In order to reduce the impact of this pull round, coxes need to start the overtaking manoeuvre well in advance of the pier (i.e. they need to stop well downstream of it). In the marshals meeting it will be made clear that waterborne marshal 6 need to maintain vigilance and give explicit instructions to stop crews well in advance of the pier. 2014: Incident following racing where a rower struck his hand on the side of the boat and had a piercing injury to the palm from one of the bolts on the rigger. Safety launch got rower back to shore for first aid treatment. He made his way to hospital and there was no need for follow-up. 2015: Concerns regarding apparent late concession of bump between first two boats in Ladies’ division just after Kew Road Bridge and some minor boat damage. Need for early concession highlighted in instructions – emphasis on ‘two canvas’ rule – a bump is inevitable if there is overlap of more than a canvas through the stroke cycle and there is less than a canvas width between the two boats. Note that the risk assessment matrix is a subjective tool and the individual cells are numbered for reference purposes only. Emphasis on responsibilities of individual club captains at UH committee meeting and elsewhere to ensure compliance with marshalling instructions and attendance at coxswains’ meeting. Emphasise need at briefing for marshalling launches to be in designated position throughout marshalling and race. Total system failure will require control to consider suspension of event. The event will not commence without nine fully functioning launches. If a launch failure occurs during the event, then control will take immediate steps to identify a reserve launch. If one is not available, then the control/CU will review whether suspension of racing is appropriate. If a reserve launch is brought into action then control to check launch. UHBC identifies responsibility of individual club captains at UHBC committee meetings and elsewhere to provide equipment in line with British Rowing ‘Row safe’. Risk of immersion, hypothermia and drowning. All private matches based at ULBH will have appropriate rescue boat provision from recognised provider. The event cannot commence without adequate safety boat cover. Back up via RNLI if needed. Rowers will need to satisfy individual clubs regarding competence to swim; if not competent then they must wear an appropriate buoyancy aid or lifejacket. Other officials will also have basic life support provision ability. LAS outside of UH/ULBC control. Designated primary evacuation route via ULBH. CU and organising committee to review ebb flow rates over previous few days, and aim for early notification (>24 hours) to competitors about changes to the planned events. If ‘red’ flag then event may not proceed on the ebb and no oared boats should be allowed on the Tideway; rowing may be possible during the time between low and high water but the stream speed may still be high and on the ebb and the CU & organising committee may sanction senior crews only to race in this period provided there is a direct assessment of conditions immediately prior to such racing. If ‘amber’ flag then only senior crews may boat on the ebb and the CU and organising committee may sanction senior crews to race in this period provided that there is a direct assessment of conditions immediately prior to such racing. It may be possible for the CU and organising committee to sanction intermediate and novice crews to race during the period between low and high water but only if there has been a direct assessment of conditions immediately prior to such racing. No crews comprising members who have less than two term’s rowing experience should boat during the ebb stream in ‘amber’ flag conditions. CU and organising committee to review weather forecasts over previous few days and aim for early notification (>24 hours) to competitors about adverse weather conditions. If gusts are forecast >35mph in a direction parallel to the river and against the stream then there is a high likelihood of unrowable conditions especially near high water (e.g. at Brentford on the ebb with an easterly wind). However the Mortlake reach is relatively sheltered from the prevailing southwest wind direction and it may not be possible to accurately predict the impact of high wind speed on the water conditions until the time of the event. If there is doubt then the organising committee will instruct a delay in boating from ULBH and TSSC until there has been a course inspection by the CU. The CU and organising committee may determine that it is possible to achieve safe racing conditions by curtailing the course (finishing at ULBC) – see appendix 11. Heavy rain or other climatic conditions may temporarily reduce visibility and the CU will monitor the situations during the event. If the visibility is reduced such that the railway bridge cannot be seen clearly across the width of the river from the balcony of ULBH then the event should be suspended. Effective use of bank marshal (spotter) downriver of race finish to advise of oncoming vessels; to liaise with start. Monitoring of VHF channel 14 by CU and safety launch (VHF licenced). Failure of cox to keep adequate look-out. Depth of water behind PLA moorings at Brentford & position of wooden post. Launches 4 and 7 to be on station promptly and monitor crossing points. Launch 4 to control revised Brentford crossing point, launch 7 opposite UL. Pre-race information to coxes, only experienced coxes (30 hours experience minimum) permitted to race; emphasise care to be taken when proceeding to the marshalling zone to avoid other crews proceeding in the opposite direction on the flood (especially at the crossing points (upstream of ULBH and at revised Brentford crossing). Port-hand buoys helps control risk by identifying correct navigation channel. Provision of crossing indication at the revised Brentford crossing point (UHBC tin fish with sign anchored to riverbed) – emphasis on crews proceeding around the crossing sign on Surrey and then taking the crossing rather than crossing before the sign. Launches 3 and 4 to hold crews below crossing if excess congestion. Launches 1 & 2 to supervise second attempts. Stakers to go no further in than waist height; emphasis at coxes and marshals meetings. Note no incidents since 2011. Stakers must stand back and keep a good lookout. Launches equipped with adequate megaphone and flags. Procedure for turning in pre-race information to coxes (coxes’ meeting); including discussion about Chiswick Bridge RZ (general issue, relevant to crews returning to TSS. Navigation back to ULBH in coxes’ meeting, launch 7 to supervise crossing of crews back to ULBH (assisted by other launches as available) at water outfall.